This is a guest post by Judith Wayte, in which she describes how she prepares her students to use Twitter professionally. Judith is based in The School of Biosciences at The University of Nottingham where she leads efforts to support students through integrated placement programmes and assessment of professional skills. She is interested in how to develop students’ digital capabilities and the link with professional skills, and is a big fan of Twitter. You can reach her at @UoNBioscicareer. For a brief 15 minutes one Friday in April the hashtag for our professional skills module #D224G1 was trending on Twitter. Orchestrating the module’s first Twitter chat seemed to have worked well following a number of weeks of preparation and personal nervousness in the run up to the day. Our professional skills module aims to get students thinking about future career pathways and provides an opportunity to acquire some of the professional skills employers seek. Fundamental skills such as digital capability and interpersonal skills such as professional communication are key parts of this. The starting point had been from my own experiences at the university of repeatedly hearing employers advising students to clean up their on-line act. We know that students recognise their digital identity as a graduate is important for their future yet through connections on Twitter I have gained insights into whole new worlds, made great contacts and had some fun. Having a window in on scientific conferences through conference hashtags is awesome. In this blog University College London’s Carl Gombrich encourages students to be part of networks, not duly waiting for the next lecture instalment. Twitter has been the way I’ve had access to the views and thoughts of so many I now admire in the area of digital capability and on-line identity. Helen Beetham originally defined digital literacy as the capabilities that enable an individual to thrive (live, learn and work) in a digital society and JISC (the organisation who champion the importance and potential of digital technologies for UK education) have outlined a really useful model of the elements of digital capability, recently updated to include digital identity and well being. The module’s digital literacy session included a few on-line activities and tasks to help the students start to think about their digital identity, and taking Catherine’s prompts, encouraged our students to start thinking about who would they like to be having conversations with and what questions would they like to be asking. Over the course of around six months we had sourced a number of willing collaborators both internally from within the university and externally. Having been told of the contributors a few days in advance of the Twitter chat the students were asked to think about which of the contacts they wanted to have conversations with and what they would like to ask. On the day, practicalities included a quick run through to make sure students had taken photos, planned questions, planned their introductions and thought about who they were going to be talking to in the session and some ground rules. In similar ways to other Twitter chats like HEAChat chat, the plan was to have a Twitter chat for an hour. The students would introduce themselves on Twitter and then introduce themselves from a scientific view – what do they enjoy about their degree course and which parts do they find interesting. Questions were then posted every 10 mins to encourage conversations to take place and the students had the opportunity to Tweet in a professional role for an hour both with internal academic colleagues and with the outside experts. In reality, in a room of around 150 undergraduates there were some students who had looked at the pre-material and some who’d not; some started to ask questions before the start time and some never got beyond introducing themselves on Twitter, and some were just following what was happening. For a quick insight into some of the conversations that took place this Storify gives an insight into what happened. (A Storify is a curated collection of Tweets). Would we do it again and differently next time? Absolutely yes. Some of the busiest people in the Twitter chat though were the scientists we recruited to help us, so we’d need to think more about how to make it easier for them and maybe encouraging more student-to-student on-line conversations. 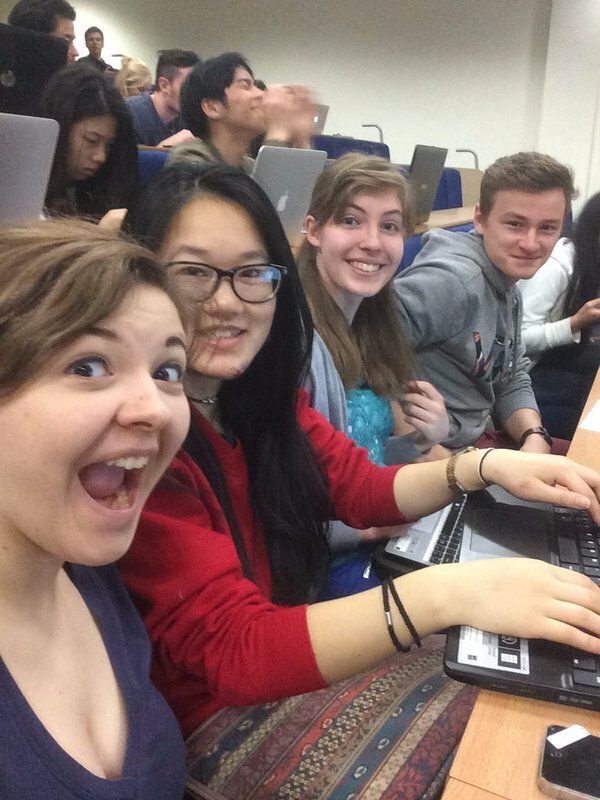 There are some Bioscience courses such as Plant Science which only have a few students at a number of universities around the UK – could these students take part in on-line discussions together and show the collegiality of universities? I’d also try and do more to ensure the students have looked at the profiles of the scientists they would be having their discussions with and to plan more questions. To finish, this would not have been possible without the generosity of both many internal academic colleagues and external scientists who were willing to take the time to support out students practicing their on-line identity as bioscientists. Martin Hawksey has this very cool thing called TAGS that can show connections. Each circle represents someone who posted on the hastag and the lines portray when the post is in reply to another scientist or includes a scientist in the response. 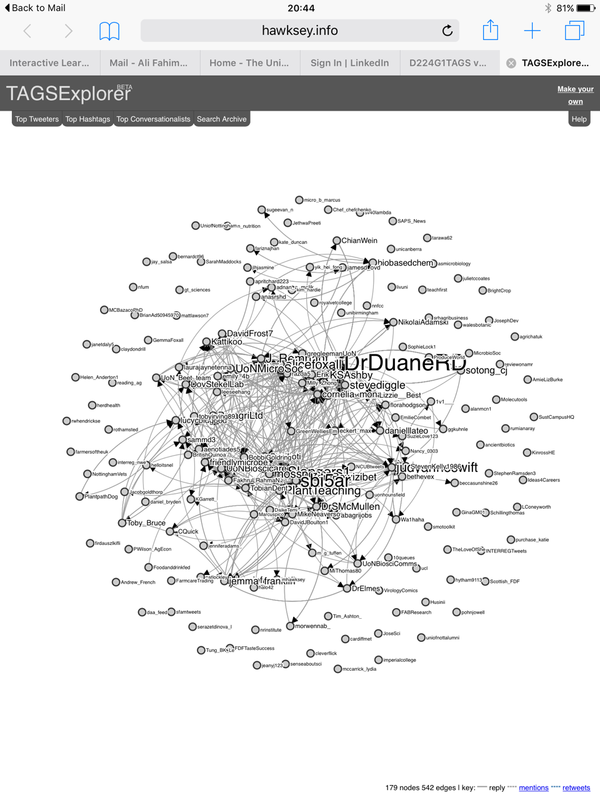 The map generated from our Twitter chat (using the hashtag) shows many of our students networking and linking to others. Congratulations, Judith and all – and many thanks for the mention and the links. Sounds like you initiated a great introduction to digital identity and the power of networking for the students you are working with. Do you plan to continue this activity next term? Are there any other ways you plan to encourage open and networked learning throughout the term? It’s encouraging to see open educators like yourselves working together to enable such learning opportunities for students – and blogging about it 🙂 Best of luck and I look forward to your future updates.